Coastal waters, including bays and estuaries, contain a wide variety of species and habitats. However, coastal waters are also extensively exploited for various economic activities, such as tourism, fisheries, shipping, and aquaculture. Therefore regular monitoring of coastal water quality is essential for a proper coastal resource management. Ocean-colour satellite sensors help us monitor our ocean but their spatial resolution is often too coarse for detecting the small features near the shoreline. Land surface monitoring missions on the other hand, typically with a higher spatial resolution, offer some interesting possibilities for these complex areas. Let me explain to you why. Land surface monitoring missions are not designed to offer coastal products, but by investigating their potential and limitations, studies have learned us there are interesting possibilities for water quality monitoring. Concrete successful examples so far include the use of the Landsat-8 and Sentinel-2, both designed as land missions. We now also investigated the potential of a lower cost micro-satellite, PROBA-V, for this purpose. We explored the potential of PROBA-V products for water quality mapping in coastal regions. The PROBA-V satellite, launched in 2013, covers the entire Earth every 5 days at a 100 m pixel resolution and near-daily at 300 m pixel resolution. Although the satellite is originally designed as a land surface mission, the image quality provides opportunities to extend its applications to coastal waters. Results show that by applying a dedicated atmospheric correction above water and an appropriate water quality algorithm, it is indeed feasible to utilise PROBA-V observations for coastal water monitoring. The use of iCOR for the atmospheric correction is key in this case, as the tool distinguishes a water pixel from a land pixel and applies a dedicated correction. 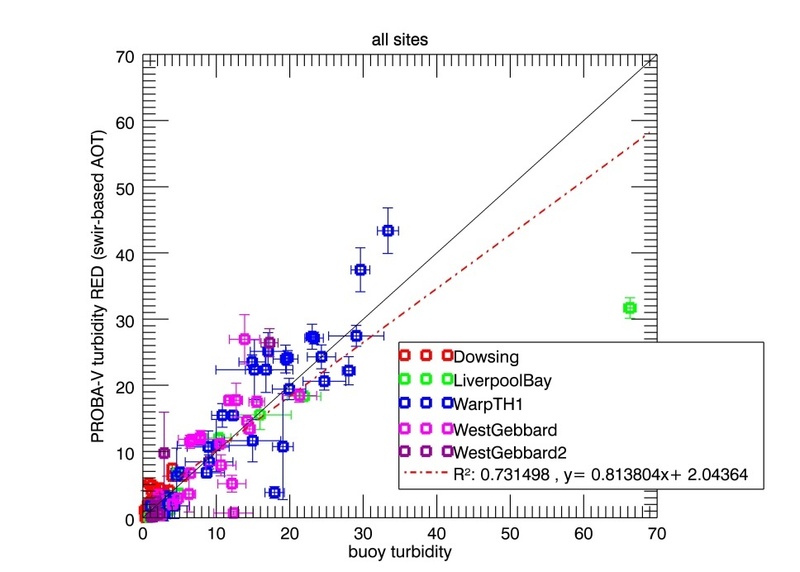 Comparison between in-situ measured turbidity and PROBA-V derived turbidity.The different colours represent different sampling stations. The figure shows a plot where PROBA-V derived turbidity values, expressed in Formazin Nephelometric Unit (FNU), are compared with in-situ measurements. The different colours represent different sampling stations in the North Sea. You can clearly see that the values overlap. After comparing ocean-colour data and Earth observation data captured by PROBA-V, similar turbidity levels and patterns are found. The main advantages of using higher spatial resolution data, in this case PROBA-V, are clearly visible in the images of the Scheldt Estuary and near outlet with more complex and detailed spatial patterns. PROBA-V sensor (100 m) on the right, both captured on 3 April 2016. Are you interested in the PROBA-V coastal products? Mid-2018 all research will be ended and evaluated, and you will be able to access and use all PROBA-V coastal products generated in the framework of the PV-LAC and Proba4Coast projects. Want to stay informed on the release of the products? Keep an eye on our website or follow us on twitter to check our latest remote sensing insights. Acknowledgement - Received ESA-funding in the framework of Advanced Land, Aerosol, and Coastal Products for PROBA-V (PV-LAC) project - Received BELSPO funding in the framework of the Proba4Coast project.